← The head of the state is leading the way,.. Yesterday I got several funny ideas and most of them were about the police and their problems about their psyche and how they feel emotional disturbed at work. Did you read the news, .. (http://www.svt.se/nyheter/regionalt/nordnytt/psykisk-ohalsa-bland-poliser) Eeh, there is nothing new with emotionally disturbed police officers! Lack of empathy, I thought that was a requirement to become a police officer. To me it seems that the most of the police officers sit in their cars and looking for suspected maniacs in matte black Chevy pick-up truck, … Yes you guessed right, my company has a matte black Chevypickup and guess if I am used to be stopped. I have my hideout in Karlstad, a small suburb of Oslo. 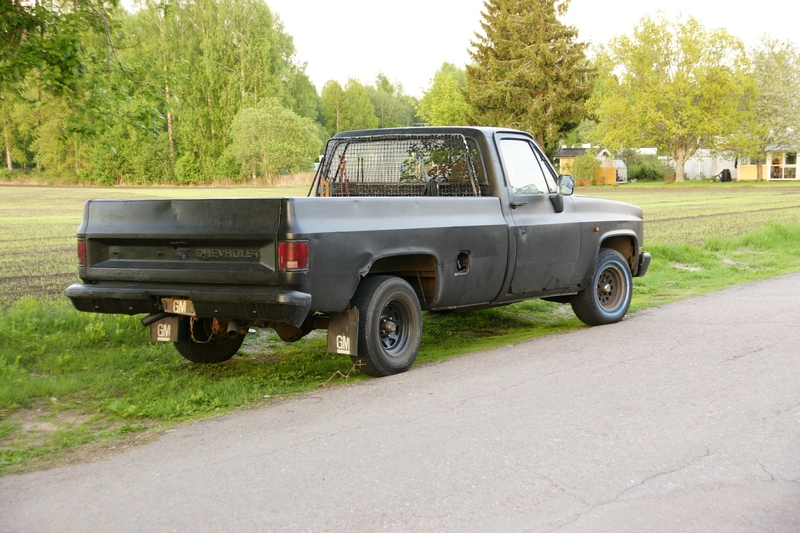 In Karlstad the police are diligent in stopping suspicious car, that will include my matte black Chevy pickup. What I am being accused for? Well the police surely doesn’t know… And neither do I. An early beautiful spring day in April, I have had enough. I stod parked at the Shell gas station and had just been playing my lottery numbers with the wonderful odds 1:6 724 520 per line played. when they drove by on the main road and suddenly made a deceleration, swung towards the gas station. I started calmly my Chevy and left the parking lot, I met them around the corner and they stared so hard that I thought their eye balls were about to pop out, probably full of admiration of the beauty they just passed. Shortly thereafter, I had them back in the mirror and they were flashing around with their fine polished blue lamps, .. But since I had already been stopped 3 times this lovely rose-smelling week, I decided to ignore them, enough is enough, so I let them be there behind me and neglected the blue piercing light that suddenly had emerged behind my beautiful truck. I drove gently and slowly home to my little castle. I always drive gently and careful. My neighbours that reluctantly recognized my Chevy stared even worse than the police had done at the gas station and greeted with some hesitation when I happily waved and drove past them with the bigoted police behind me …. Guess if they were emotionally disturbed when I stepped out and began to question why they were harassing me and my lovely car …. I guess the most have probably been said about the police and their view of the usual gritty workers, .. A tip to the police, that most criminals want to be invisible in traffic, so they are probably more likely to drive a Volvo v70, Sweden’s most common car, … Oops, this can create a new thinking among the police ….